The USB 2.0 Ranger® 2301GE-LAN allows users to extend USB 2.0/1.1 connections over a GigE LAN or single CAT 5e/6/7 cable up to 100m in point-to-point fashion. Extending over LAN saves on installation time and provides IT visibility.. The USB 2.0 Ranger® 2301GE-LAN allows users to extend USB 2.0/1.1 connections over a GigE LAN or single CAT 5e/6/7 cable up to 100m in point-to-point fashion. Extending over LAN saves on installation time and provides IT visibility. 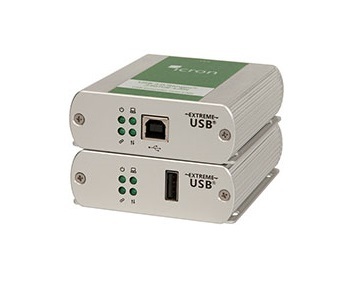 Additionally, this ExtremeUSB® based 1-port USB 2.0 LAN extender system is FCC/CE Class B certified and ideal for use with all USB peripherals including: keyboards, mice, interactive white boards, flash drives, hard drives, audio devices, web cameras and any other USB 2.0 or 1.1 device.